But wait... there's more alliteration! 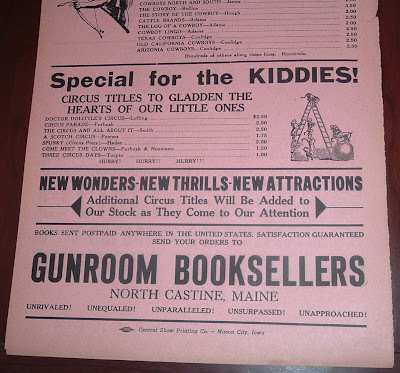 I have to hand it to Gunroom Booksellers of North Castine, Maine, whose advertising ephemera evokes an era of entertainment extravaganza elocution. 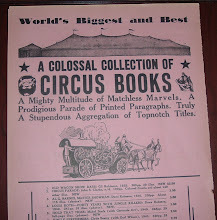 Their large, double-sided broadside successfully captures the spirit of the circus days of yore with a worthy string of superlatives that would make an old carny barker proud. 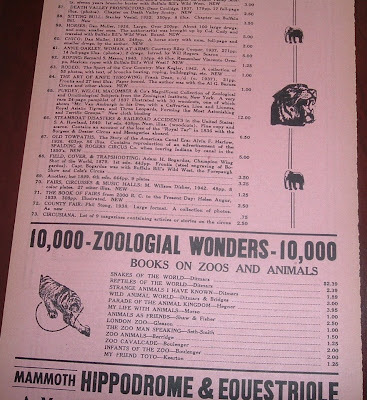 This is one of the larger pieces of ephemera for a bookseller I have in my collection. 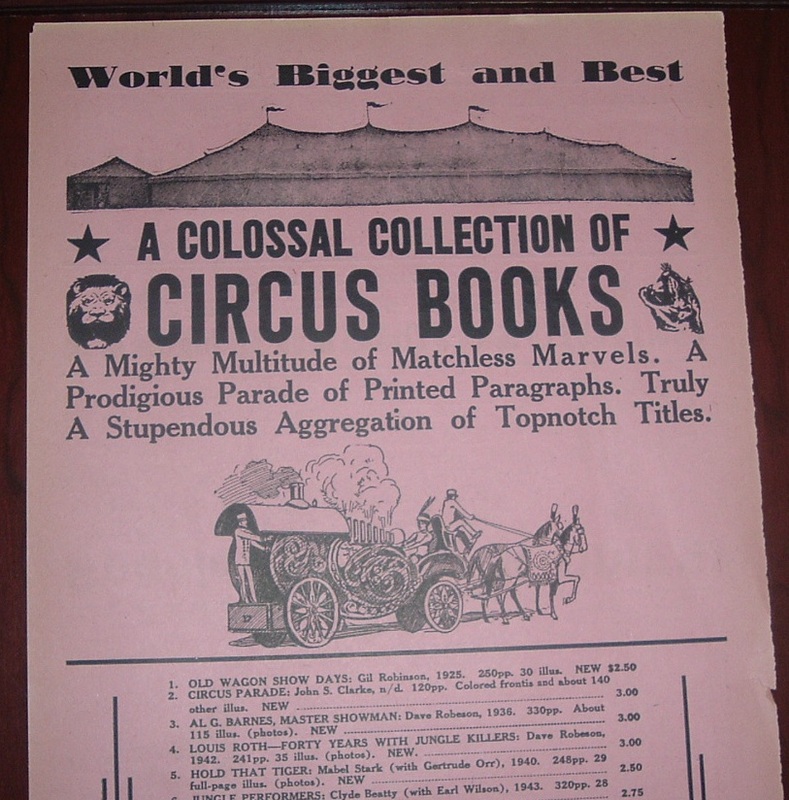 It's size, more than two feet in length, fits the Big Top style of the subject matter, which is books about the the history of circus and circus-style shows. 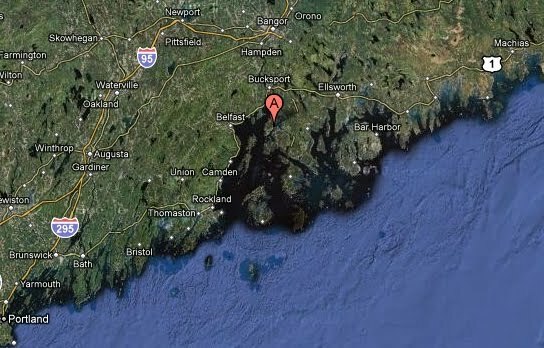 I was reminded of this piece by a recent blog post at Sarah's Books Used and Rare, which explored the architectural details of Castine, Maine. Were Gunroom Booksellers still in business, perhaps the lure of old books a few miles to the north would have gotten some coverage in Sarah's post as well. 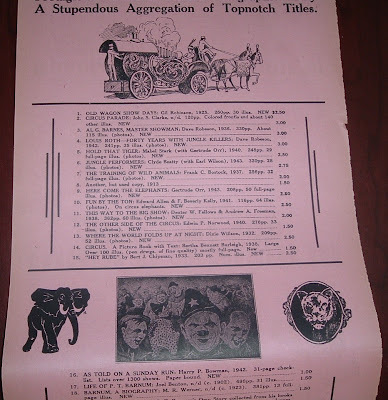 This broadside dates to the 1940s-1950s, best guess by listed prices and other ads by the bookseller found on the Internet (same era). I make the assumption that the book shop is no longer in business, at least by the name Gunroom, simply because they do not show up anywhere in present-day when searching for their history. 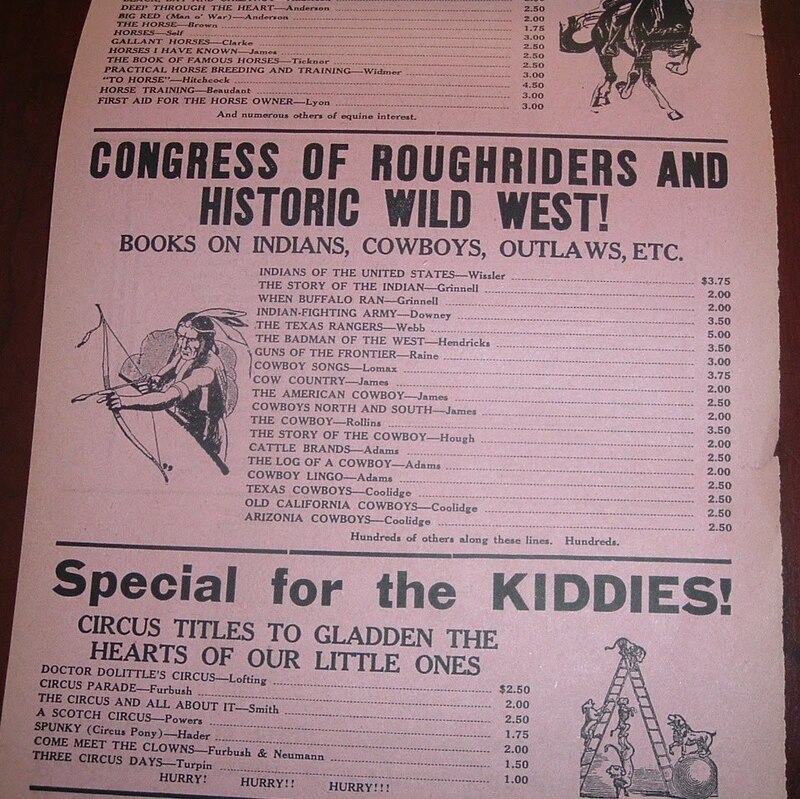 Suffice it to say, they specialized in circus material and their inventory likely lived up to their slogan of "World's Biggest and Best." 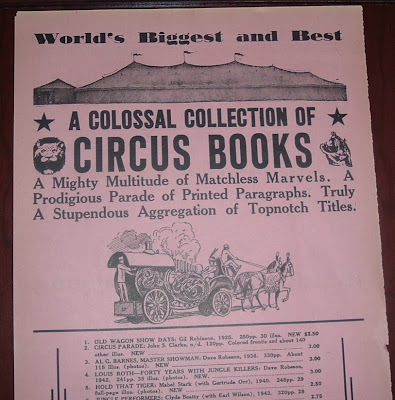 What seems unlikely is that North Castine, Maine was once home to the "World's Biggest and Best" collection of circus literature. But why not? 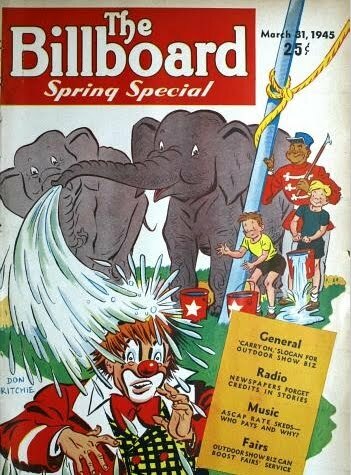 When you look at an old Billboard magazine from the 1940s, you'll find tons of circus ads for coming attractions, equipment, performers, and even books from Gunroom. Both Wanted and For Sale abound. 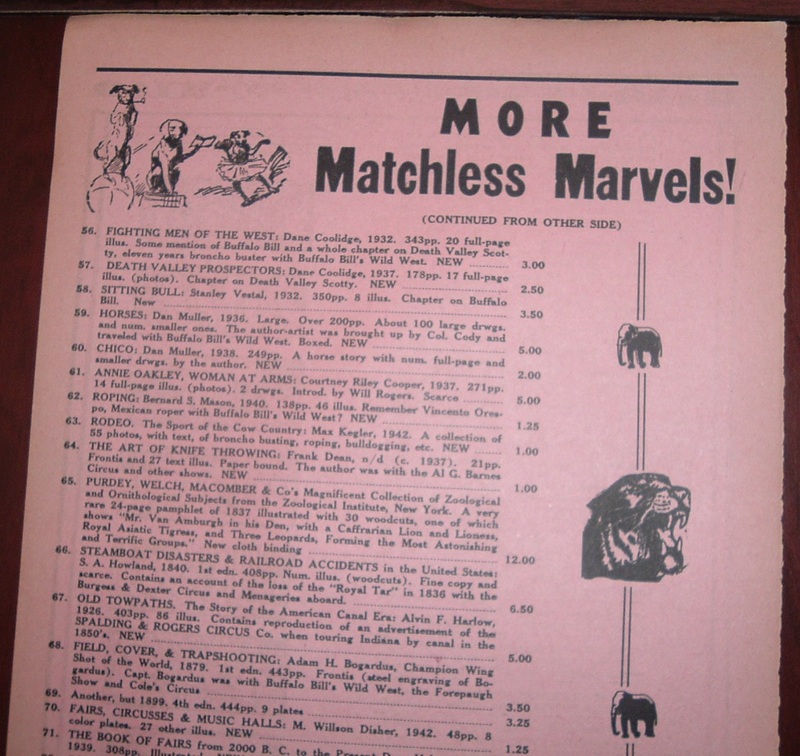 Circuses and fairs were an extremely far-reaching form of traveling entertainment and frequently entertained in small towns and popular vacation coastal communities, such as those that dot the Maine coastline. So a book shop dedicated to Circusiana could be just about anywhere and draw interest. Even in North Castine, Maine, indicated by the "A" in the Google map below. 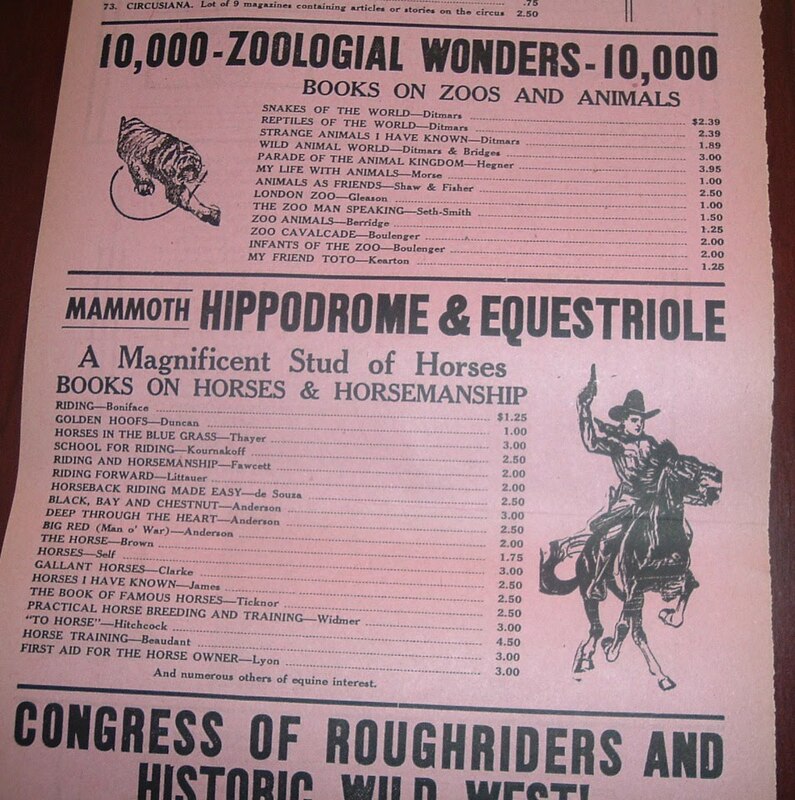 Here's the rest of the front side of Gunroom's advertisement, in a couple of images necessitated by the size. 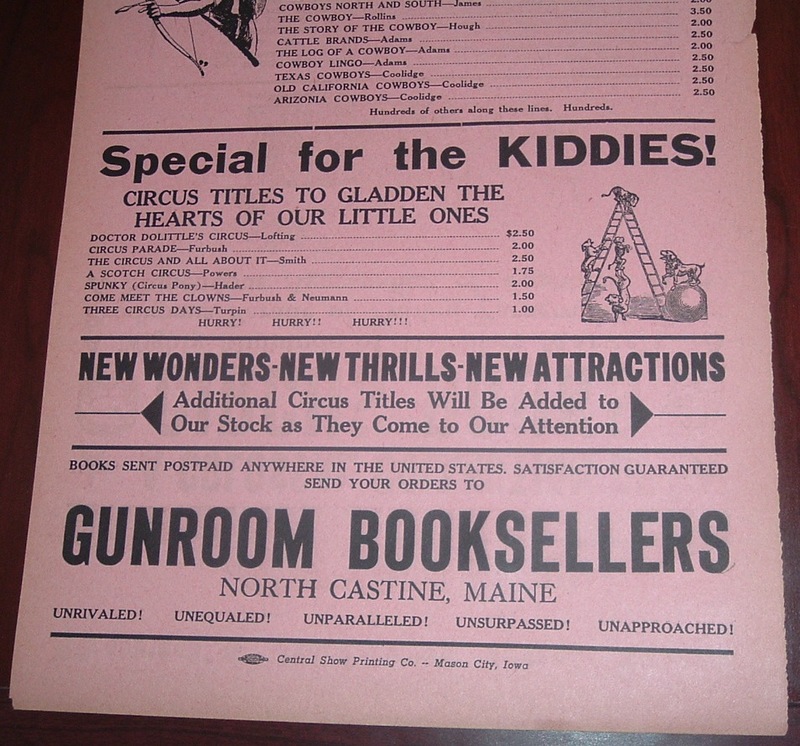 By the way, the name Gunroom doesn't exactly lend itself to a book shop specializing in circus entertainment, does it? Firearms, yes, but not the circus. This broadside has a backside, which would preclude its display against a flat surface. You've got to be able to see that backside, too--that's where the bookseller is identified. 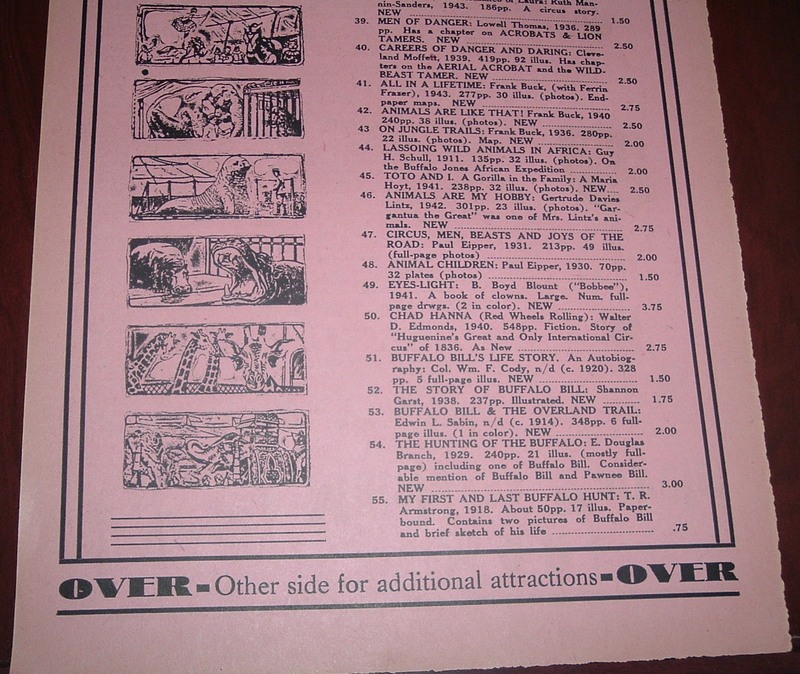 To that end, I recently found another copy of Gunroom's broadside since first obtaining this one. I may want to frame this piece and would want to see both sides, without taking it off the wall. 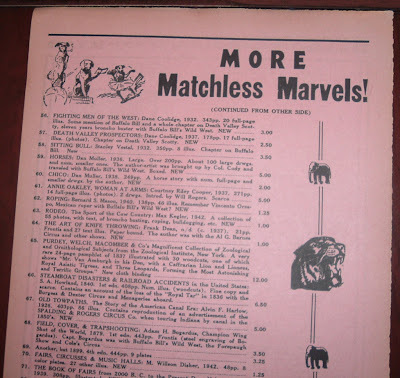 More Matchless Marvels kick off the backside and segue seamlessly into Zoological Wonders, Equestrian, and the Wild West, which gets a bit off the circus route. But it all feels related in this unusual and interesting bookseller's print ad. That may have also summed up the feelings of a circus buff's visit to Gunroom Booksellers. 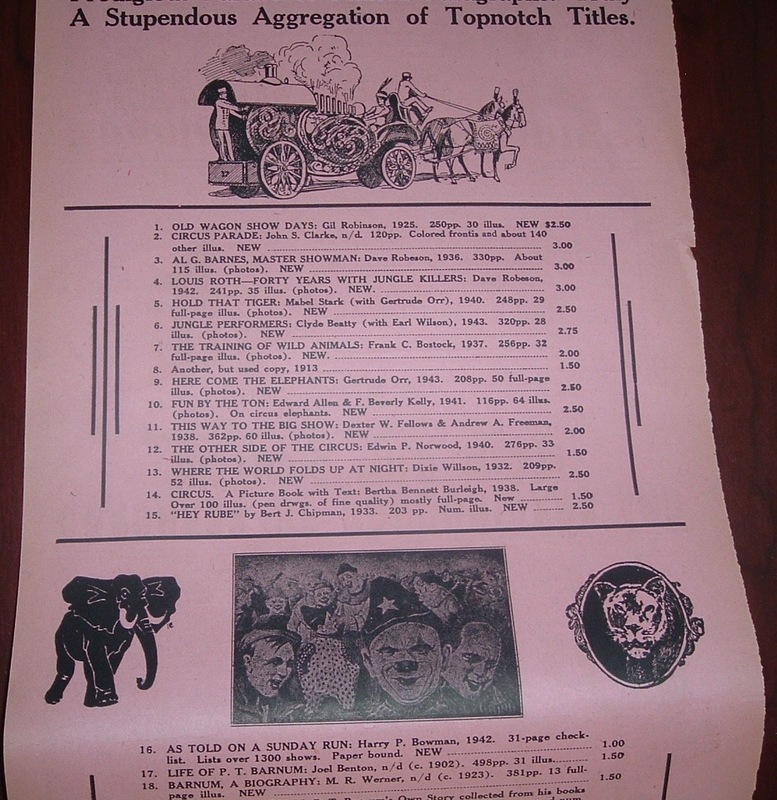 I got this 1923 ad cover for The Thresher, the student newspaper at Rice Institute (now Rice University) in Houston because of the local history, which I collect. Turns out, though, it has a pretty good biblio angle so I thought I'd share it here as a piece of ephemera appropriate for this blog. 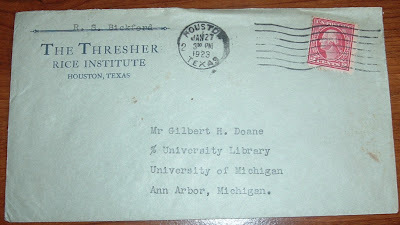 Had it not been connected to my native city's history, I might have passed on this piece and I would have overlooked the book connections and interesting history that I discovered by researching the addressee on the envelope--Gilbert Harry Doane (1897-1980). 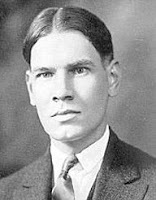 Doane was a librarian and professor with positions at several university libraries, most notably the University of Wisconsin. He was also an author, genealogist, and book collector. As one of his books (About Collecting Bookplates) would suggest, he also collected bookplates. Other books he wrote included The Legend of the Book and Searching for Your Ancestors. I've done a lot of genealogy research over the years and have actually owned and read Searching for Your Ancestors. At the time, I paid little, if any, attention to the author. Doane appears to have worked first as a genealogist, when he took a position, upon graduation from Colgate in 1918, with the Genealogy Society at the U.S. Naval Training Station. That's an interesting pairing and I would like to know what exactly the Genealogy Society was doing for the U.S. Naval Training Station. As World War I was ending that year, or may have ended by the time Doane went to work, I wonder if the Navy was putting together some kind of genealogical archive of biographical data for those who served in the war. The photo of a young Doane and a reference to his genealogy work (and other interesting work during another WWII) was found HERE. In 1920, Doane returned to school and began work on the first of two graduate degrees from two different universities, the University of Arizona (1922) and the University of Michigan (1924). 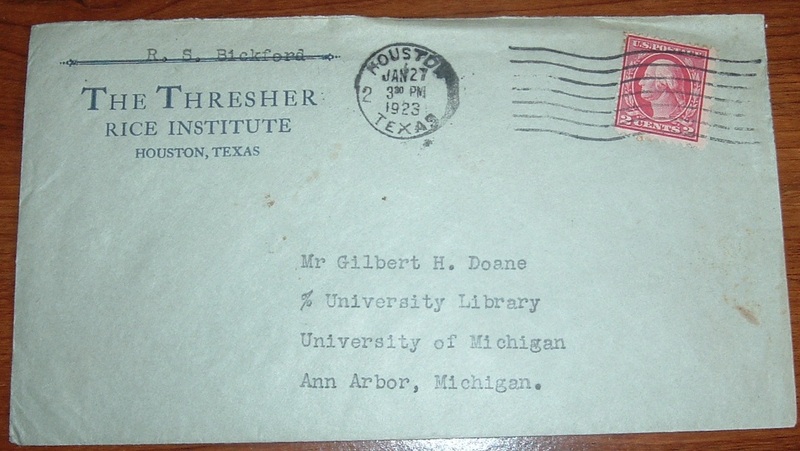 At the time of the letter from The Thresher's office at Rice Institute to Doane, in care of the University Library at Michigan, Doane would have been working at the library and working toward his second graduate degree. One assumption I have about this letter is that someone at The Thresher was writing Doane about sending copies of the Rice newspaper for his library's collection. Possibly, Doane had inquired and The Thresher office was replying to his inquiry. 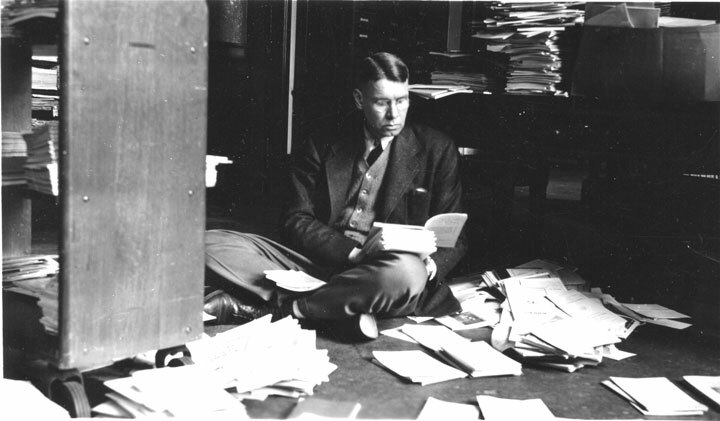 Upon graduation at the University of Michigan, Doane accepted positions at the University of Nebraska as a librarian and professor, where he would remain for more than a decade. 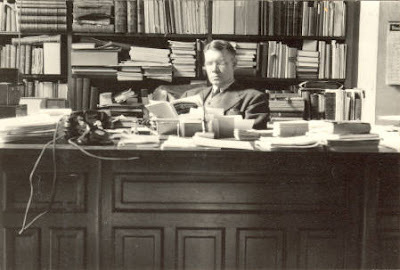 In 1937, Doane moved to the University of Wisconsin for the remainder of his long career as Director of Libraries and Director of the University of Wisconsin’s Library School (1938 to 1941). The image below is from the Wisconsin Historical Society Digital Collection and shows Doane in his office at the the University of Wisconsin. By the way, the Library History Buff, Larry T. Nix, recently visited the Wisconsin Historical Society and included some great photos of the renovated library reading room on the Library History Buff Blog. World War II interrupted Doane's career from 1943-1945 when he was recruited for service with the Monuments, Fine Arts, and Archives (MFAA), an interesting U.S. Army program where, as Captain Doane, he aided the Allied Forces in the protection of historical monuments and the conservation and restitution of art and cultural artifacts stolen by the Nazis. He left the service as a Major in 1945. Doane returned to Wisconsin after his hitch with the MFAA and in 1956 assumed the position of Archivist with the University of Wisconsin. He retired in 1962 as Professor Emeritus. A couple of other interesting facts about Doane before I leave him, gleaned from the MFAA site: He was an ordained priest in the Episcopal Church and served as historiographer of the Diocese of Milwaukee between 1937 and 1967. This piece of ephemera is a prime example of why I like collecting such things, in that you never know where or what you will uncover with a seemingly insignificant piece of paper. From this postally-used envelope with a return address of interest to me, some interesting history came to light about librarianship, books, genealogy, and even some interesting history from the Second World War. Nearly one hundred years ago, the idea of a portable bookshop, motorized on wheels, was just that--an idea. 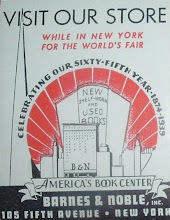 Then along came Christopher Morley's little book, Parnassus on Wheels, in 1917, and the idea soon became a reality in the summer of 1920 thanks to a woman named Bertha Mahony. 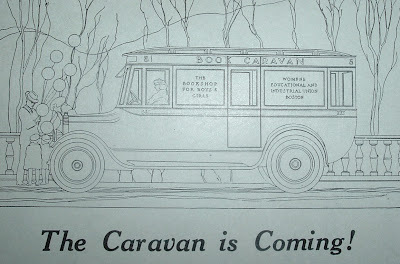 Bertha Mahony was the driving force (no pun intended) behind the bookshop caravan. 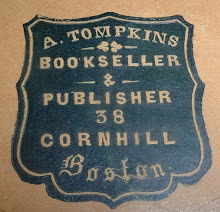 She was the founding editor of the Horn Book Magazine (publications about children's literature) and later founded the Bookshop for Boys and Girls in Boston in 1916. She began to envision selling books from a rolling caravan throughout rural New England before Morley's Parnassus on Wheels was even published, but Morley's book may have provided the encouragement she needed to make her dream a reality. 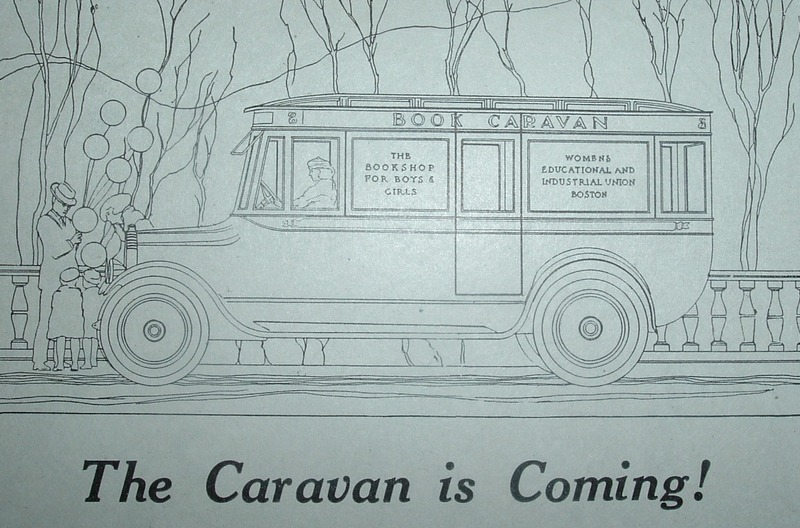 The Horn Book site has a Virtual History Scrapbook with articles and images of the Bookshop Caravan. Barbara Bader wrote an excellent piece in 1999 about its history, titled Treasure Island by the Roadside. I initially learned about the caravan from an obscure source (a footnote in a book), which I wrote about on the Archaeolibris blog. 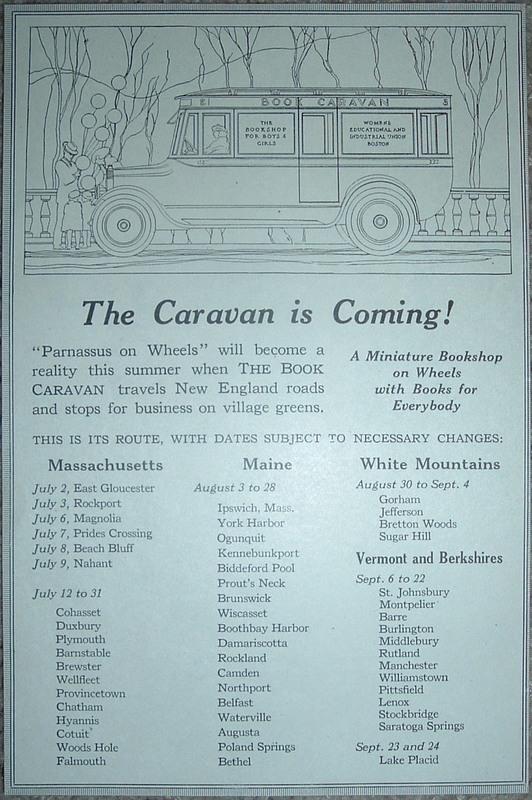 My search on the subject led to the 1920 advertisement below (now in my collection) for the "Miniature Bookshop on Wheels," as it was referred to. 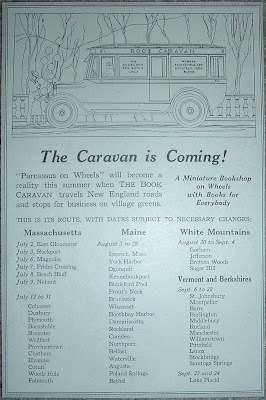 Extracted from a contemporary publication, it also offers an illustration of the caravan, as it was envisioned at the time, along with a schedule of stops on its inaugural route. Real photos of the caravan, as well as related images of a log book, can be seen HERE. 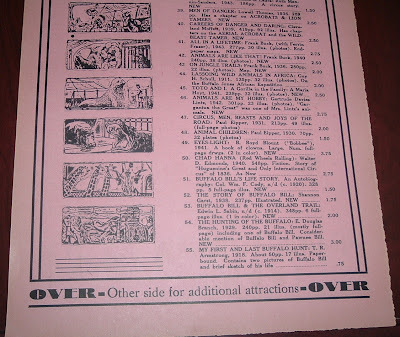 For another set of scrapbook entries, which feature original clippings of publicity for the bookshop caravan, click HERE. There, you'll also find a link to a readable format for the clippings. 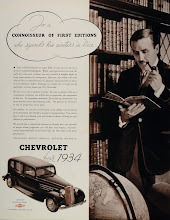 For a related post about book automobiles, I recommend Larry T. Nix's fine article HERE. My bookplate collection is small and I have not yet acquired a celebrity bookplate, so to speak. But I may have one that is an indirect brush with celebrity. 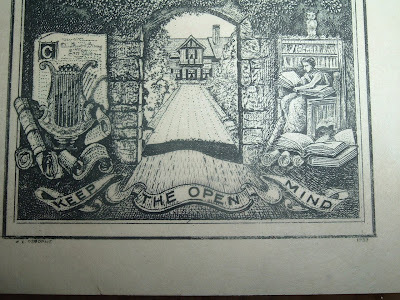 Here is an ornate bookplate designed in 1933 by W.E. Osborne (of whom no information) for an Albert Clayburgh with the motto, KEEP THE OPEN MIND. But which Albert Clayburgh? As I keep an open mind about who this might be, my research keeps turning up two Albert Clayburghs--both prominent citizens of New York City in their respective days. And I have come to believe that this Albert of the ex libris is the father of actress Jill Clayburgh. I hope so because I have always liked Jill Clayburgh since first seeing her on the big screen in Silver Streak. I found this particular bookplate while going through the same batch of bookplates that produced the engraving of the Hogarth crest (later determined not to be a bookplate), which I wrote about HERE. 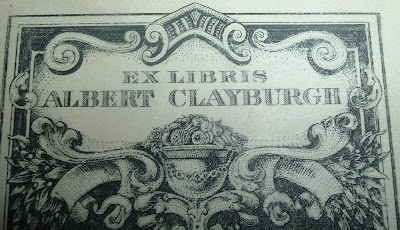 I found Albert Clayburgh's bookplate and for some reason immediately thought of Jill Clayburgh. Too much of a longshot was my next thought, but as I researched Albert Clayburgh, only a few Alberts kept showing up in the results. Both were in New York and both were successful businessmen. And one of them was indeed the father of Jill Clayburgh. "....a distinguished sixty-five year career in book production, representing a company that distributed the highest quality bookbinding cloths. Bill came to be synonymous with this facet of the business." "...active in many trade associations related to his publishing career such as the Typophiles, the American Institute of Graphic Arts, the Book Manufacturers Institute and the Bookbinders Guild. At the same time, Bill supported and actively pursued cultural interests in literature, the theatre, opera, and ballet." From his alma mater, Princeton, this 1997 memorial makes the connection to Jill Clayburgh. Further research turned up a family tree that shows Albert Clayburgh, Jr. (the "Cotton King") as Albert H. "Bill" Clayburgh's father and, therefore, Jill Clayburgh's grandfather. 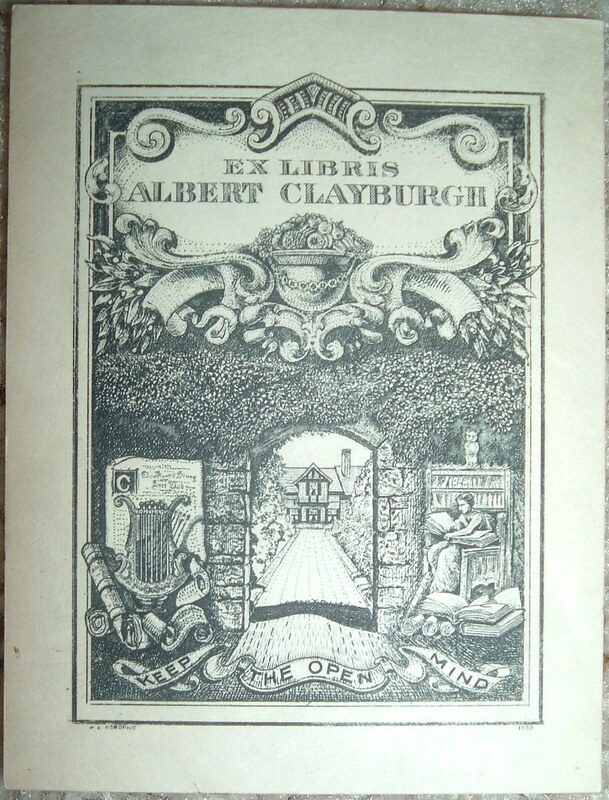 From all this, I would conclude that Jill Clayburgh's father, a bibliophile and book arts businessman, was the likelier, of the two Albert Clayburghs I found, to have owned this bookplate. 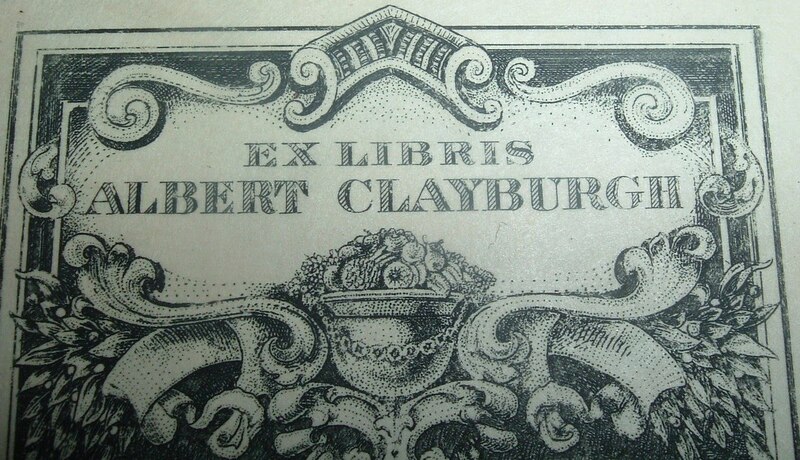 Further, the date of the bookplate is 1933, a few years after Clayburgh was graduated from Princeton. The timing was right for a young bookman starting out in the business to have his own bookplate, or upgrade from an existing one. Of course, keeping an open mind about this, I would welcome my assumptions being either corroborated or disproved by a reputable authority on the subject (Ms. Clayburgh, are you reading this?). There's no typo in the title. 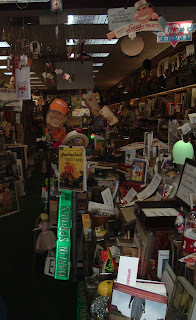 That's Reed (not Read), as in Jim Reed, proprietor of Reed Books - The Museum of Fond Memories in Birmingham, Alabama. I visited that fine, historic Southern city last week for the inaugural IndyCar Grand Prix of Alabama (actually down the road in Leeds) and stayed downtown, where I found a jewel of a book shop to browse for an hour or so. I could have stayed all weekend in that shop. I managed to find a few books on regional history, something I like to look for in new locales, and my wife found a few Civil War pamphlets of interest. As Jim Reed checked us out, I got the bookmark above and asked for any other ephemeral items related to his business and told him I blogged about such things. That was all he had, but he handed me a handful more of the bookmarks and said, "Spread the word!" And so I am. If you find yourself in Birmingham, or passing through, and have a little time to spare, a visit to Reed Books would be worth your while if you like browsing old book shops and the serendipity of finding hidden treasures. The book shop is located at 2021 Third Avenue North in downtown Birmingham, in the building with the name Lehr Middlebrooks and Vreeland (see photo below). 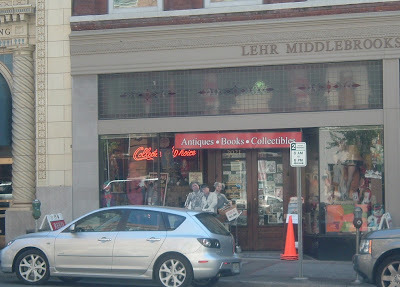 The place has some book history to it, as it used to be an old U.S. government bookstore. Reed Books is undoubtedly much more fun to poke around in than the previous shop run by Uncle Sam. For lovers of rare books and Americana, as well as collectors of ephemera and memorabilia of all stripes, Jim Reed's collection of more than 45,000 items will certainly draw you in and hold you spellbound for a while. You may find it difficult to leave! Additionally, he has somewhere in the vicinity of a quarter million more items warehoused in storage. If you don't find what you're looking for or have specific interests, be sure and let Jim know about it. Likely as not, he can put his hands on it for you. I knew I'd have no trouble finding something of interest, but I told Jim of my specific interests and he went to work for me finding or suggesting books for my consideration while I continued browsing. In a city known more for its historic role in the Civil Rights Movement, we left Birmingham with fond memories of activities that probably wouldn't register very high, if at all, on a Birmingham word association test: Antiquarian Book Shop and IndyCar Race (Nascar perhaps, but not IndyCar). The two complemented each other just fine as far as I was concerned and we left with fond memories of both and much more in this friendly, historic city. Vitor Meira in for a pit stop during warm-up laps. I'm in Birmingham today for the Alabama IndyCar Grand Prix at the Barber Motorsports Park. This post is slightly modified from a piece I wrote two years ago and seemed worth repeating for today's event. 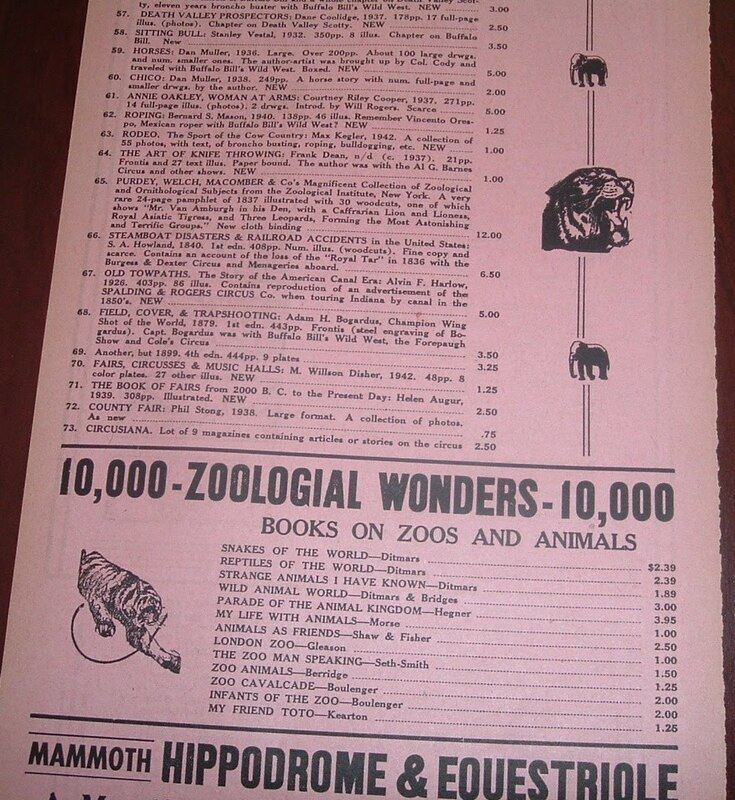 I found this book shop label (also known as a ticket) in a 1969 volume of Autocourse. 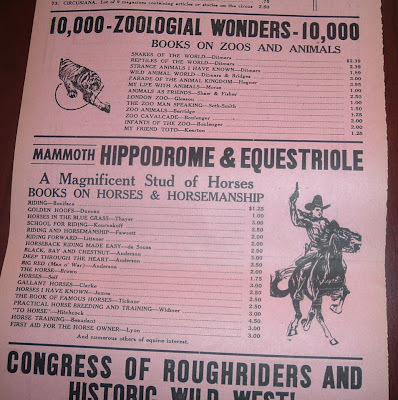 The bookseller was Classic Motorbooks in Minneapolis. I thought about removing it, but I let it go. The book quickly sold and I regretted not saving the label. But I did take a picture of it before the book was shipped overseas. I was curious to see if the bookshop still existed; after all, it's been nearly 40 years since that label was affixed inside the rear cover. To my surprise, it does exist, albeit in a dramatically altered state from its humble beginnings in 1965 in a Minneapolis garage. 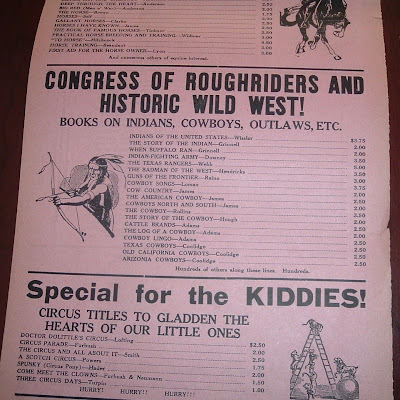 Through expansion, publishing, name changes, and changes of ownership and business focus, Classic Motorbooks morphed into MBI Publishing and its three imprints: Motorbooks, Voyageur Press, and Zenith Press. And they were purchased in 2007 by Quay Publishing. Over the last 40 years, the little book shop grew, got into publishing, grew more, and hopped around the country in a succession of coast-to-coast acquisitions. After Quay purchased them, their headquarters were moved back to Minneapolis where it all began. And today Motorbooks.com continues the vision of its original owner, Thomas Warth, selling good books to motorsports enthusiasts. Read more about the company's history here. I was going to title, or even subtitle, this one, "Turkey at the Berlin Congress." The image on this card caught my attention. 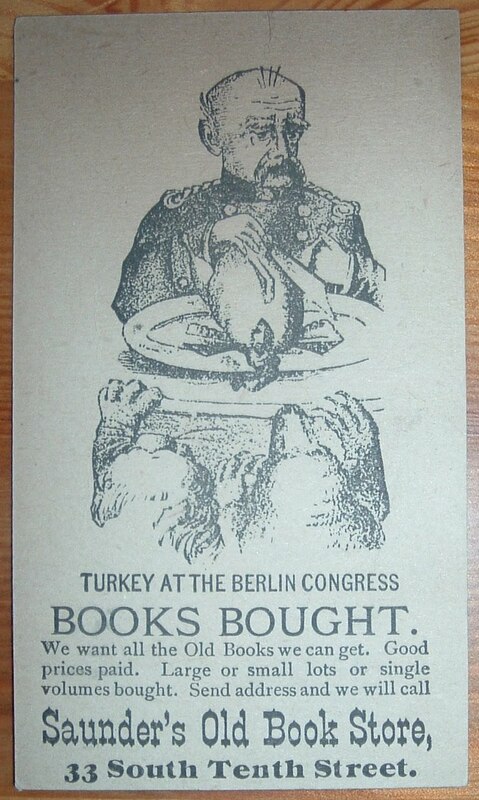 I knew it was a bookseller's trade card, but I couldn't make the curious connection to a platter of turkey and the Berlin Congress, whatever that was. And so I had to have the card. And then a history lesson. The Congress of Berlin (13 June - 13 July 1878) was a meeting of the European Great Powers' and the Ottoman Empire's leading statesmen in Berlin in 1878. In the wake of the Russo-Turkish War of 1877–78, the meeting's aim was to reorganize the countries of the Balkans. Up until Berlin, Turkey had been viewed as a European power. Stripped of almost all European territory, it was no longer viewed as part of Europe. "I'm not sure what all that had to do with a Philadelphia bookseller, but the cartoon on the trade card at least helped me date the card to 1878. I assume 1878 because of the timeliness of the event and because it wouldn't have relevance for later years. 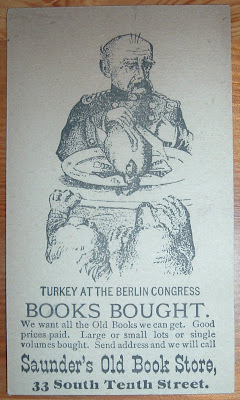 I have found other political cartoons about Turkey at the Berlin Congress, so I also assume the Berlin Congress was a big deal in the US to warrant a cartoon in local papers, not to mention a bookseller's trade card. 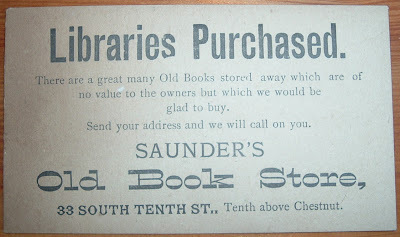 I know that Saunder's was in Philadelphia because of the address on the card. A quick consultation with a map shows the streets are consistent with the street address on the card. What I'm curious about is if Saunder's printed a new batch of trade cards whenever world events seemed significant enough to warrant a new cartoon to help sell a few books. That they needed fresh stock is evident by the dual-sided pleas for books. They purchased libraries and small collections and books they claimed their owners had no interest in. "You don't really want those old books, do you?" 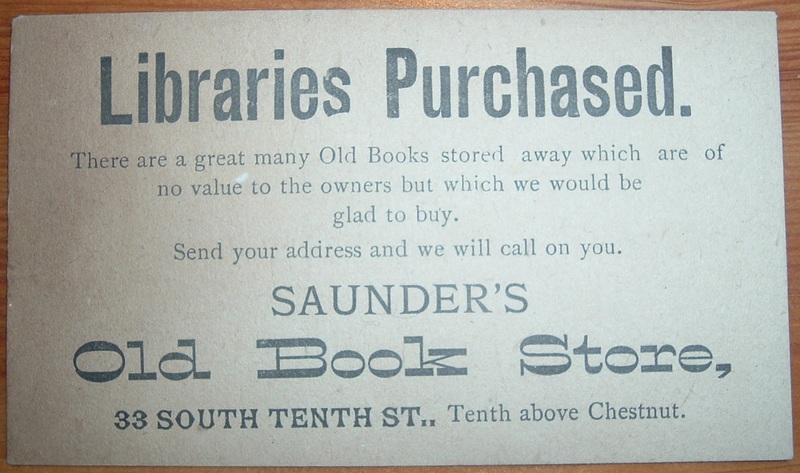 I make one last assumption here that Saunder's enjoyed good sales (to support their buying habit) and that they enjoyed some longevity. But the scarcity of information on the firm makes it difficult to put together a decent bio on the company. But if a picture is worth a thousand words, then maybe some of those words would describe the creativity Saunder's had for attracting customers and the fact that a sense of humor was part of the firm's culture. Today they would have gone broke printing new cards to keep up with all the political lampooning that's part of our culture.